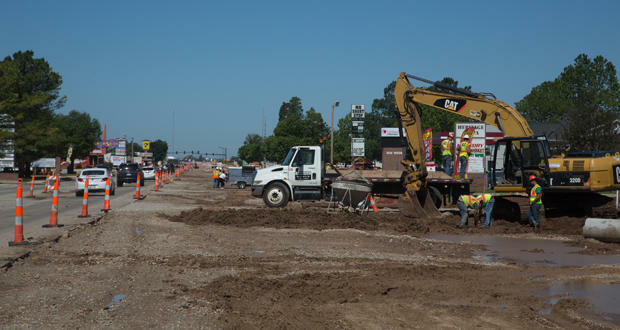 Motorists travel past construction on Lindsey Street in Norman. The owners of some businesses in Norman have seen a decline in sales due to ongoing road and bridge construction along Lindsey Street. International Pantry general manager Kristen McCall says sales have declined about 30 percent since the spring of 2016 when the I-35 exit closed. The Oklahoma Department of Transportation is currently constructing a new bridge over I-35 at Lindsey. The Journal Record’s Molly Fleming writes internet sales have also hurt the business. Thompson Pools and Patio co-owner Mike Thompson says his business has dropped by about 12 percent compared to last year, and down 21 percent when compared with two years ago. Journal Record editor Ted Streuli says business owners are concerned the construction will have long-term implications. “The retailers said that they’re worried that shoppers will develop new patterns during the construction, new shopping patterns, and they won’t break those new habits easily and return to their old ones,” Streuli said during his weekly conversation about business with KGOU. Crews poured concrete for the I-35 bridge earlier this week, and construction should be complete by this summer. However, Streuli says delays are possible. “The Department of Transportation told us last week they might have to halt some projects if state appropriations get cut as many are fearing, but so far it’s proceeding as planned,” Streuli said. Jacob McCleland: Ted, Journal Record report Molly Fleming writes there’s been a dropoff in sales at several places. Which stores did she talk to, and what did they tell her? Ted Streuli: She talked to International Pantry and Thompson Pools and Patio as well as the city and the chamber of commerce. The retailers said they’d had a significant drop in business because of the construction, and Mike Thompson, the pool and spa dealer, said specifically his business was down 12 percent, but he did pointed out they were down 21 percent two years ago, so although they’re not thrilled, it’s not as bad as they feared. McCleland: Are the store owners concerned their businesses may not be able to survive? Streuli: No one said that to us directly, but the general manager at International Pantry said she’s really felt the pinch of online sales since about 2008, and then cutting into the foot traffic as this does this compounds the problem. She said when the Lindsey exit on I-35 closed, they really saw business decline. McCleland: So what are the long-term consequences of all these detours, and the difficulty, really, of getting to these shops now? Streuli: The retailers said that they’re worried that shoppers will develop new patterns during the construction, new shopping patterns, and they won’t break those new habits easily and return to their old ones. So they’re fearing some long term consequences. McCleland: When are the projects supposed to be completed? Streuli: Concrete was poured on the bridge this week, on Tuesday, and it should open this summer. The city is handling the street work, which should be done by November. McCleland: Are there any concerns about the bridge project not finishing on time? Streuli: A little bit. The Department of Transportation told us last week they might have to halt some projects if state appropriations get cut as many are fearing, but so far it’s proceeding as planned. McCleland: I want to switch gears just a minute and talk about some action at the Oklahoma City Council. Councilman John Pettis, Jr., has called for a review of the city’s noise ordinance. What brought this on? Streuli: Councilman Pettis said the proposed ordinance change was prompted by complaints from residents near the Lost Lakes Amphitheater and Waterpark at NE 10th Street and Bryant. McCleland: So residents have been complaining about Lost Lakes. Has Pettis been hearing complaints about the nearby Zoo Amphitheatre, too? Streuli: He says that he has, so it’s all of that is going to be part of the city’s reviews. McCleland: We should mention that the Insane Clown Posse is holding their three-day Gathering of the Juggalos concert at Lost Lakes Amphitheatre in July. Does this play into the complaints at all? Streuli: Pettis didn’t mention that event specifically, but said nearby residents were growing pretty weary of all the loud concerts, often on weeknights and well past 1 a.m. The neighborhoods over there established decades ago, and the park was built pretty recently, so residents, Pettis said, were not expecting the problem when they bought homes. McCleland: Some of the proposed changes are pretty significant --- concerts could only be held on Friday, Saturday and holiday nights, and only until 11:00 p.m. Would it affect future concerts that are already scheduled at the venue? Streuli: It could, yes, but the Zoo Amphitheater already has strict rules regarding timing and decibel level and such, so it’s likely to have a great effect on shows at Lost Lakes. What’s the next step for the proposed noise ordinance revisions? The proposal has to be reviewed by the Oklahoma City Planning Commission before a final decision by the City Council, but it should all be resolved well before that Insane Clown Posse show which is scheduled for late July.